How Much Impact Do Toxic Chemicals Really Have on Society ? * More than 7 million accidental poisonings occur each year, with more than 75% involving children under age 6 ! * The average American uses about twenty five gallons of toxic, hazardous chemical products per year in their home. A major portion of these can be found in household cleaning products. * Women who work at home have a 54% higher death rate from cancer than those who work away from home. The 15-year study concluded it was as a direct result of the much higher exposure rate to toxic chemicals in common household products ! * The toxic chemicals in household cleaners are three times more likely to cause cancer than air pollution. *Of chemicals commonly found in homes, 150 have been linked to allergies, birth defects, cancer, and psychological abnormalities. * Cancer rates have continued to increase every year since 1970. Brain cancer in children is up 40% in 20 years. Toxic chemicals are largely to blame. * When combined, chemicals are even more dangerous. Deadly fumes result from mixing ammonia with bleach (both found in many household products) creating lethal “mustard gas” ! * According to the National Research Council, no toxic information is available for more than 80% of the chemicals in everyday-use products. Only 1% of toxins are required to be listed on labels, because companies classify their formulas as "trade secrets." 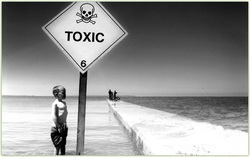 * In the past 50 years more than 75,000 chemicals have been introduced into the environment. Today 300 synthetic chemicals are found in the bodies of humans. Even newborn babies have synthetic chemicals passed on from their mothers. - Excerpt from REACH (Registration, Evaluation, and Authorization of Chemicals), a European Union regulation on chemicals and their safe use. * More than 32 million pounds of household cleaning products are poured down the drain each day nationwide. The toxic substances found in many of these are not adequately removed by sewage treatment plants. Guess what happens when these are returned to the rivers from which cities draw their drinking water ? - Spring 2002 Edition of CCA Newsletter Partners "Cleaning Without Toxic Chemicals"
* More than 75,000 chemicals are licensed for commercial use. More than 2,000 new synthetic chemicals are registered every year. * The EPA tallied close to 10,000 chemical ingredients in cosmetics, food and consumer products. Very few of these chemicals were in our environment or our bodies just 75 years ago. * In 1998, U.S. industries manufactured 6.5 trillion pounds of 9,000 different chemicals* In 2000, major American companies dumped 7.1 billion pounds of 650 different industrial chemicals into our air and water. * Except in the case of foods, drugs or pesticides, companies are under no legal or regulatory obligation to concern themselves with how their products might harm human health. Within 26 seconds after exposure to chemicals such as cleaning products , traces of these chemicals can be found in every organ in the body. More than 1.4 million Americans exposed to household chemicals were referred to poison control centers in 2001. Of these, 824,000 were children under 6 years. A New York sanitation worker was killed in 1998 when a hazardous liquid in household trash sprayed his face and clothes. At any given time, there is 3.36 million tons of household hazardous waste to contend with in our country. In 1990, more than 4,000 toddlers under age four were admitted to hospital emergency rooms as a result of household cleaner-related injuries. That same year, three-fourths of the 18,000 pesticide-related hospital emergency room admissions were children. Petrochemical cleaning products in the home are easily absorbed into the skin. Once absorbed, the toxins travel to the blood stream and are deposited in the fatty tissues where they may exist indefinitely.